Starting off today’s list is the Armored Personnel Unit (or APU) from the Matrix trilogy. Making it’s first appearance in Matrix: Reloaded, it’s real c0ntribution came in Revolutions when every single unit in existence was used in the defense of Zion. Hydraulically operated, the APU was run by a single operator who sat in a central cage and operated everything through a series of hand controls and leg straps, much like the Cargo Loader from Aliens. It’s weaponry consisted of two 30mm cannons which are mounted on the arms. Loading these weapons required the assistance of an ammo carrier who would feed the ammo boxes into the back with the assistance of the APU’s crane. Due to its flexible reach, a single APU could defend itself from multiple Sentries without much difficulty. During the battle for Zion, some 350 APU’s took part in the defense. Unfortunately, they faced overwhelming odds and all were lost. Though some were still functional even after their pilots died, their systems were rendered inoperative after the Hammer arrived on scene and detonated its EMP device. This next example comes once again from the manga and anime world of Full Metal Panic. Officially, the name “Arm Slave” is short for Armored Mobile Master-Slave System, referring to their coordinated unidirectional control system. Basically, this means that a single pilot would be controlling multiple suits, either from inside a command mecha or from a remote location. Built by the US in the fictional FMP universe, these powered suits went on to become the mainstay in every western army, giving new meaning to the term “mechanized infantry”. However, these mecha were featured chiefly as the weapons of Amalgam and Mithril, organizations to whom the main characters were members. In the course of the story, every state produced its own variations of the Arm Slave and the design went through several generations. Beginning as smaller variants powered by internal combustion engines, the later models would feature cold fusion reactors and electroactive polymer muscles, making them faster, more mobile, and capable of much better performance. In terms of weapons, the Arm Slave is limited only to what it can carry, making many different configurations possible. These include, but are not limited to, two 12.7 mm chain guns, two XM18 wire guns, a single 40, 57, or 70 mm smooth-bore cannon, a single missile launcher, or hand to hand weapons such as the M1108 anti-tank dagger or the GRAW-2 Monomolecular cutter. And given its raw power and strength, it can also attack with its bare hands and just bash things to death. Good to have options! The other famous walker from the original Star Wars universe! Designated as the All Terrain Scout Transport, the AT-ST was a bipedal walker that was created by the Republic for use in the Clone Wars, but saw more extensive service with the Empire during the Galactic Civil War. 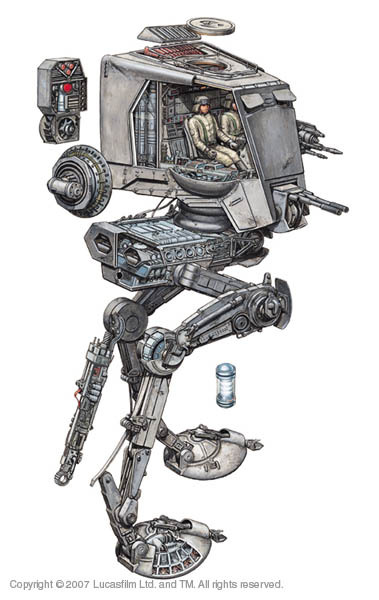 Appearing in both Empire and Jedi, the scout walker was basically the reconnaissance version of the AT-AT, often serving in a support capacity during major assaults. However, in situations where the terrain was more dense and difficulty to navigate, as was the case with Endor, the AT-ST was considered more favorable. Hence why the Imperial garrison chose to deploy several in the field while keeping their AT-AT closer to the shield generator station itself. In terms of armaments, the AT-ST carried a twin-blaster cannon on the front of its module, along with a light twin blaster and a concussion grenade launcher mounted one either side. While relatively fast and able to negotiate Endor’s heavily wooded terrain, its bipedal configuration and relatively thin armor made it vulnerable to the Ewok’s log traps. Two were destroyed in this way, while another was commandeered by Chewi and two Ewoks and used to destroy a fourth. Without any walker remaining to provide cover, the garrison was quickly routed and all their speeders destroyed. Not a very good record of service, being beaten by furry wooded creatures and their flying logs! Back to the good ol’ universe of Warhammer 40k with another installment! And this time around, boy did we bring out the heavy hitters! Here we have the Dreadnought, a heavy cybernetic mecha that is similar in concept to the Dragoon and Immortal from Starcraft. Basically, whenever a Space Marine is mortally wounded in combat, they can have their remains transferred into one of these behemoths so they can keep on fighting. 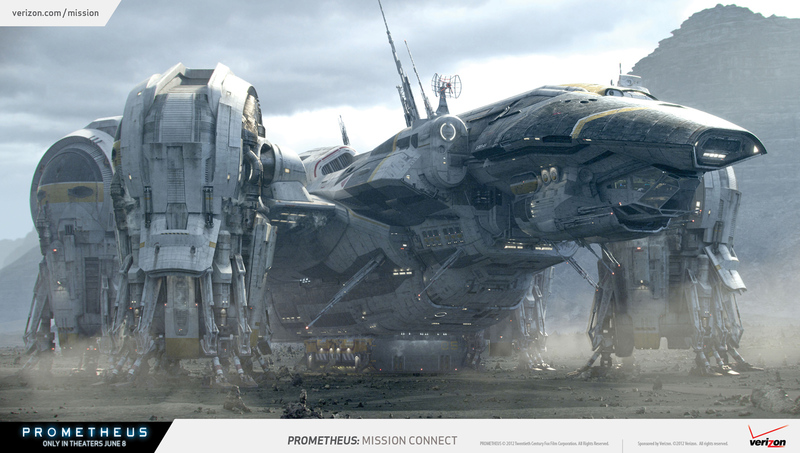 Entombed within the unit ceramite skin, the pilot controls the Dreadnought through a series of neural links from a command “sarcophagus”. As a heavy mech, the Dreadnought’s primary function is that of infantry support. 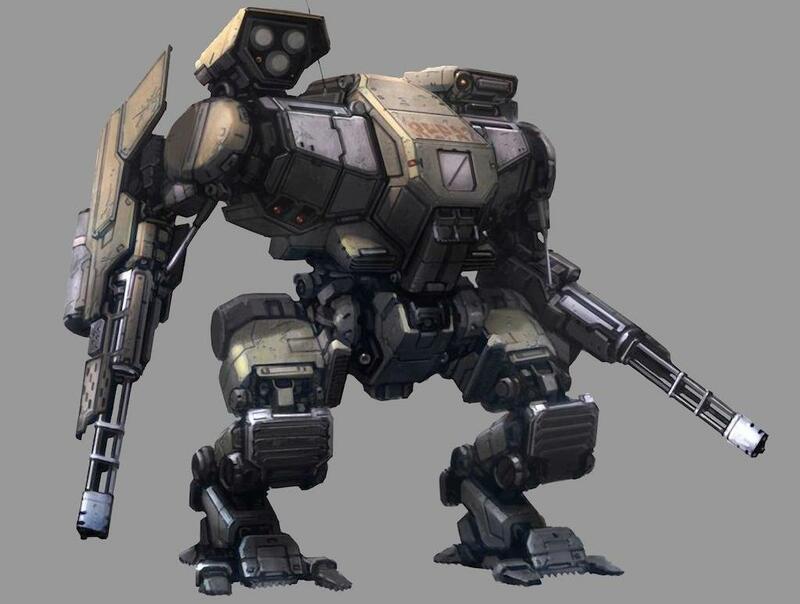 Its weaponry can take many different configurations, but often involves laser or gatling cannons mounted in the arms, missile launchers embedded in the shoulders, and additional launchers or cannons mounted over the head. Smaller weapons are generally mounted under the upper body for point-defense against lighter infantry as well. This next example comes from the F.E.A.R. gaming universe. Known as EPA’s, these bad boys are the latest generation of powered armor to come from this universe and are by far the biggest and baddest of the bunch! Much like its predecessor, the Elite Powered Armor, the Enhanced was designed for combat against both infantry and vehicles. For these purposes, it is armed with two GAU-19/A heavy rotary machine guns, one on each arm. In addition, it has three sets of rocket launchers, mounted in the shoulders and above the right arm, that launch homing missiles. For strictly defense and maintenance purposes, the EPA also has an automatic repair system which activates when the unit is heavily damaged and a new shielding system. Although it does not have the ability to engage in melee attacks with its hands, it is still capable of generating powerful stomp attacks with its feet that send powerful shockwaves in all directions. Because of their power and obvious expense, these units are rarely encountered in the game, and only ever at the end of a level. Back to the world of anime, this time for a robot that puts the swash in swashbuckling! Officially known as “Dann of Thursday”, this mecha comes from the anime of the same name and was the personal powered armor of Van, the show’s main protagonist. 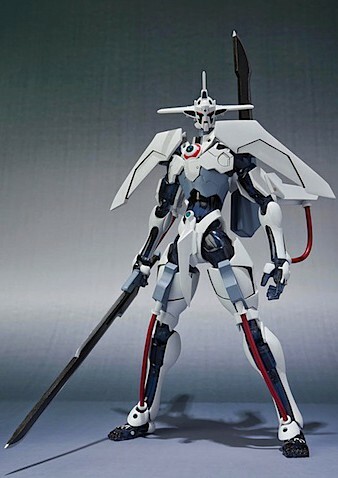 Built to resemble its user, who is also tall and lanky, this mecha is unique amongst its peers in that it has no ranged weapons. 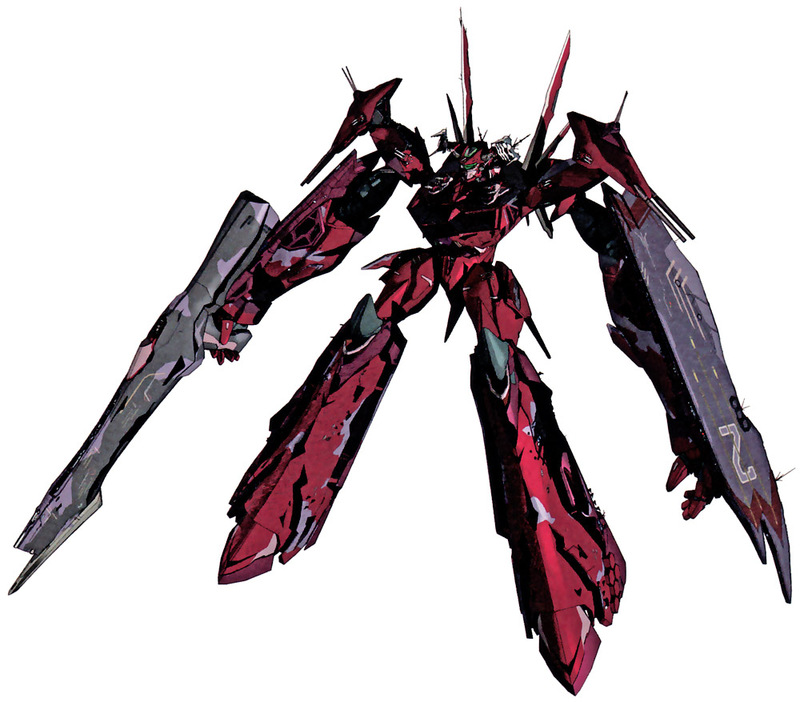 All its capabilities revolve around its central blade, which while in compact form, causes the mech to resemble a giant sword. 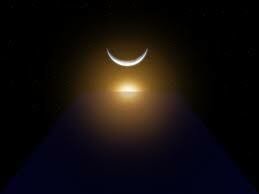 When in humanoid form, this blade can be wielded as a single sword, or broken down for use as two. In additi0n, Dann has also has an electromagnetic shield which protects it from ranged attacks. This allows van to close ranks with enemy mechs and eviscerate them with his blades. But by far, the Dann’s greatest feature is its ability to heal its pilot once they enter the cockpit. Pretty handy when you need to recover from some wounds, or just shrug off a hangover! There’s something to be said about a gentle giant, even if he is 40 feet tall and made out of solid metal. Taken from the 1999 Disney movie of the same name, the Iron Giant is distinguished amongst its peers here in that it is not only an alien machine, but a sentient one. As such, it is as much at home on a list of AI’s as it is giant robots. Apparently, this robot was meant for first contact purposes, possessing the ability to learn and boasting some rather impressive defensive protocols. When activated, these weapons are capable of evaporating tanks, aircraft and entire platoons of infantry. However, as was demonstrated, these only become active when the robot is threatened, or he becomes angry. And few things make an Iron Giant more angry than threatening his best friend in the world, which in this case was the little boy Hogarth Hughes. In addition to seeing past his massive metal frame, Hogarth taught him how to understand English and acted as his guide to the confusing world of humans. Above all, the Iron Giant demonstrated a tremendous capacity for emotion. Aside from anger, he also demonstrated love, attachment and empathy. This last aspect was demonstrated when he chose to sacrifice himself rather than bring destruction down on the town of Rockwell (obvious allusion to Roswell). Having learnt that a nuclear missile was heading for him, he chose to fly away to intercept it rather than let it destroy everything and everyone around him. So sad when gentle giants are misunderstood! 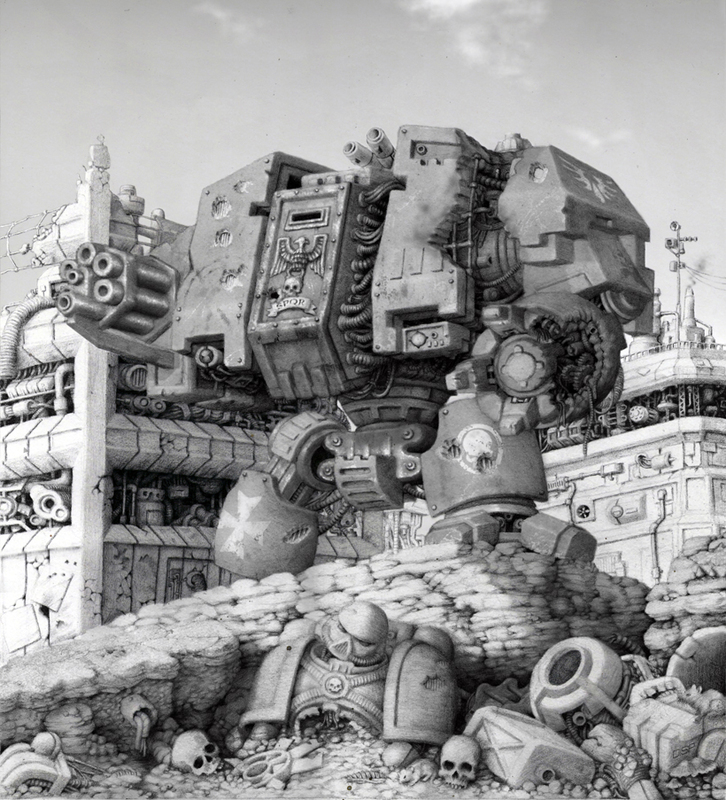 Back to Battltech, once again for an Omnimech that is the workhorse of the Clans that employ it. 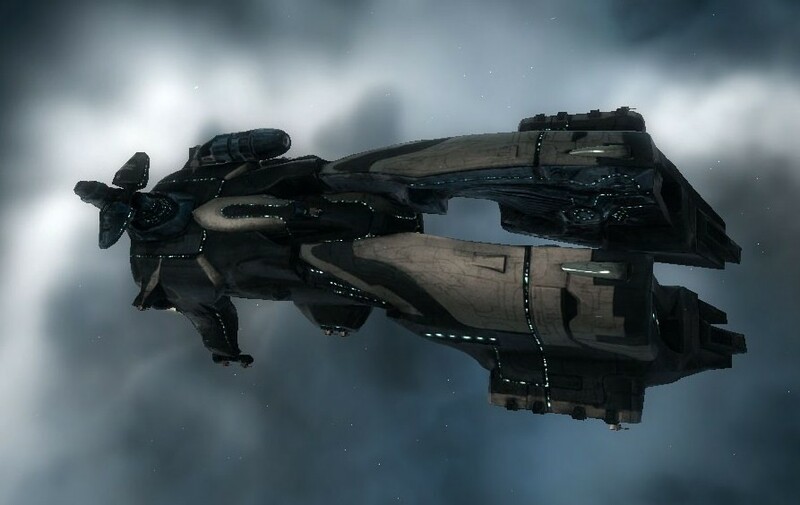 Known as the Nova by its inventors, it also bears the name of Black Hawk by the Inner Sphere who captured one and began producing their own variants of it. Designed initially for infantry support, the Nova was unique in that it was built with hardpoints which allowed infantry soldiers to easily mount and dismount. As such, the Nova could function as a mech and a sort of battle taxi, ferrying infantry into battle alongside it. In terms of armaments, the Nova was again unique in that it could be armed exclusively with energy weapons, 12 of them to be exact. 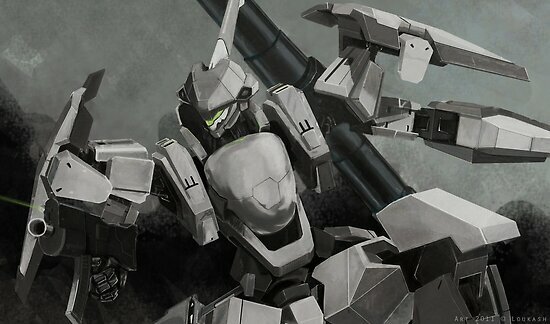 However, in other configurations, it could be outfitted with machine guns, autocannons, gauss rifles, or even a sword. These would be mounted almost entirely on its arms, but also in two large clusters around the head. Unfortunately, production of this model soon ceased after a unit was captured by Inner Sphere forces and duplicates fashioned. Believing that their mech design had been compromised, the Clans began to focus on other models to serve as their omnimechs of choice. This example is kind of obvious, surprised I didn’t think of it sooner. While I was never much of a fan of the comics, I did see a few episodes of the animated show, and these things certainly made an appearance! As a potential shout out, they were also featured in the movie X-Men: The Last Stand, appearing in the Danger Room as a simulation. 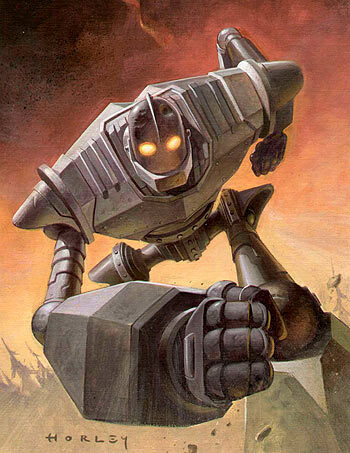 In the comic books and animated series, however, these massive robots made several appearances and were quite important to the overall story. Designed for hunting mutants, the Sentinels went through several different models. 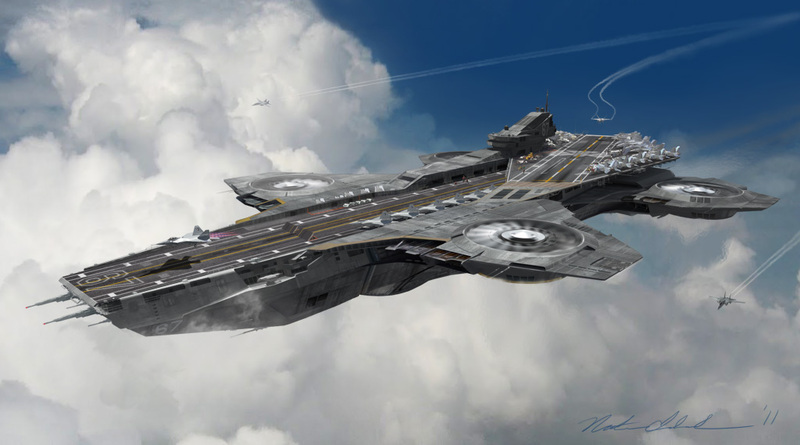 However, the most common were three stories tall, capable of flight, employed energy weapons, and had advanced sensors which could detect mutants. In addition, their programming ran from the semi-intelligent, involving advanced tactical thinking and decision-making skills, to the fully self-aware. But of course, these were few in number, usually designed for the sole purpose of commanding other Sentinels (such as the Master Mold). Many Sentinels were designed to be capable of learning from their engagements, adjusting strategies to deal with mutants of varying ability. Often serving as the antagonists in the X-Men universe, these robots were nothing if not a prime example of terrifying gigantism! Can’t believe I didn’t think of them sooner! 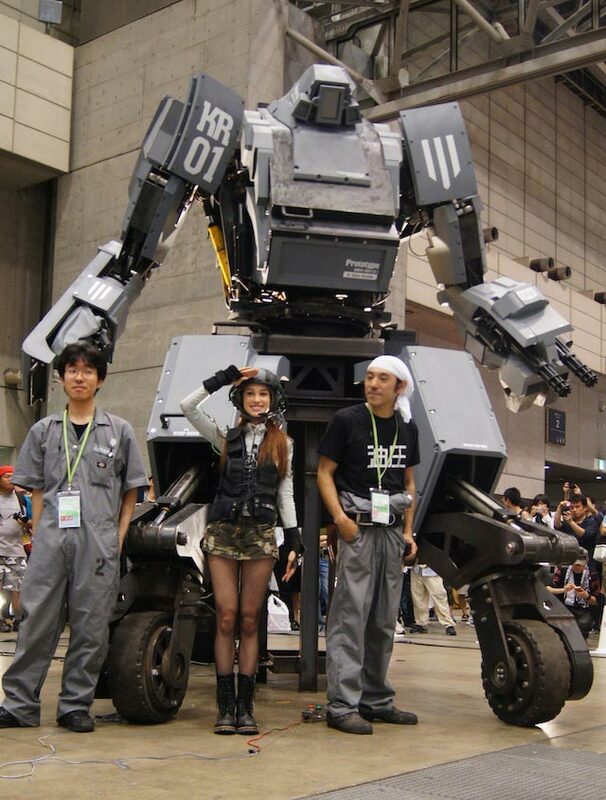 And last, but certainly not least, we return to the Macross universe for another example of an over-sized mecha! 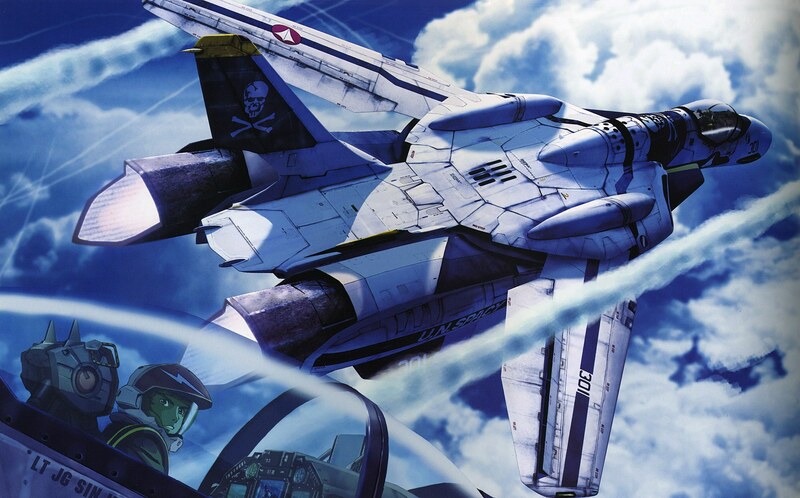 In this case, we have what’s known as a variable fighter, which is basically a mecha that is capable of transforming from an aircraft to a humanoid form. As part of Earth’s plan to counter a Zentraedi invasion, the Pheonix was a merger of fighter designs with Overtechnology. Composed of titanium/carbon composite, space metal alloy and SWAG energy converting armor, this mecha is capable of operating in space, upper atmospheres, lower atmospheres and even underwater. It’s clipped wing air design also ensures a great deal of maneuverability when in flight mode. In terms of armaments, the Pheonix prefers energy weapons to autocannons due to a lack of internal storage space. 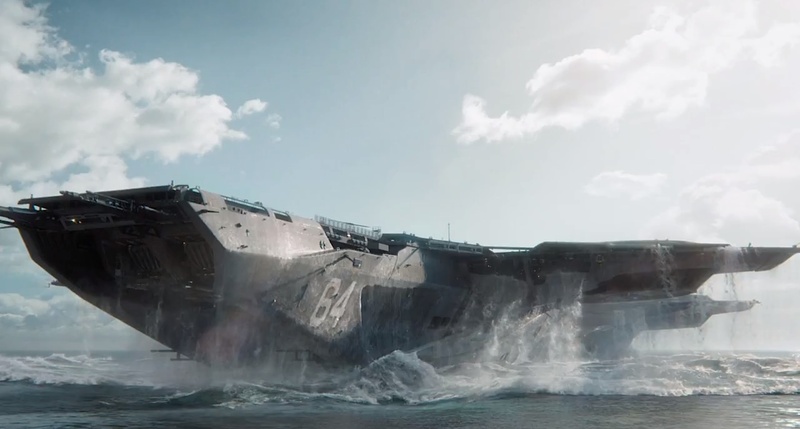 As a result, it comes equipped with either one VF-0A/D or two VF-0S fixed Mauler laser cannons, and multiple micro-missile launchers mounted in the shoulders and chest. In flight mode, it is also capable of carrying a GPU-9 35 mm gatling gun pod and up to twelve air to air or air to ground missiles or guided munitions. The Pheonix also comes with the added feature of being able to carry reactive armor for added protection. 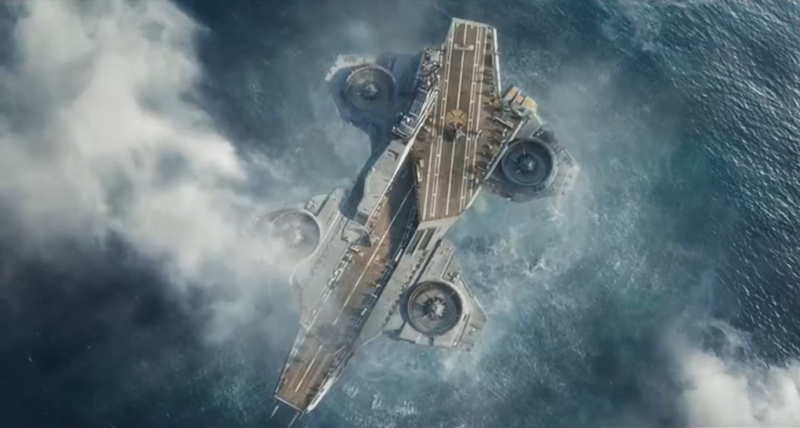 In fighter mode, it has two seats, one for the pilot and one for a radar engineer, similar to the F-14 Tomcat. 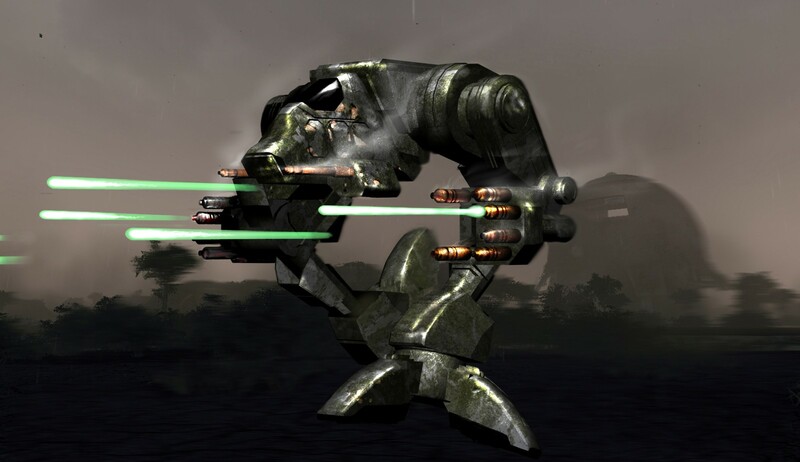 And like most variable fighters, it can also deploy in GERWALK mode (or Ground Effective Reinforcement of Winged Armament with Locomotive Knee-joint ), a sort of half-fighter, half humanoid configuration which allows for ground assaults and quick take off.